When a child starts drinking more or urinating more frequently, the thought of type 1 diabetes (and now type 2 diabetes) often springs into the parents’ minds. When should parents be concerned? In healthy children a hormone called insulin pushes sugar from the blood into the body’s cells where it can be used for fuel. This insulin is produced in the pancreas. Type I diabetes is an attack on the pancreas. Type 1 diabetes is what we call an autoimmune disease. When diabetes first begins, the insulin-producing cells of the pancreas are destroyed gradually over months or years. The remaining cells are able to compensate for this by increasing their insulin production. The body can still make enough insulin to keep the concentration of sugar in the blood within a fairly narrow range. Not until 90 percent of the insulin-producing cells are destroyed is the sugar no longer pushed effectively from the blood into the cells. The blood sugar level begins to rise. Without sugar in the cells, muscle and fat begin to be burned for fuel (evidence of this — ketones — shows up in the urine). The person feels hungry all the time, but loses weight in spite of increased eating. The person is literally starving. Meanwhile, the concentration of sugar in the blood begins to increase. When the level reaches 180 mg/dL, the sugar begins to spill over into the urine. This causes the person to make more urine and then get thirstier, creating an accelerating cycle. 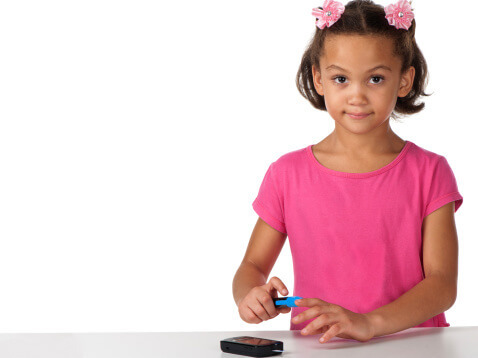 Type 1 diabetes most often strikes young people, especially between the ages of 5 and 7 (when viruses run through the schools), or at the time of puberty (when so many hormones change). For this reason, it used to be called juvenile-onset diabetes. This term has now been eliminated, since we now know that it can appear at any age. People who get type 1 diabetes were born with a genetic predisposition to it. Not everyone born with this predisposition gets diabetes, however. In fact, if an identical twin has diabetes, the other twin only gets diabetes about half the time. Some predisposed individuals are exposed to something in the environment that triggers the diabetes. This is usually a viral infection. The virus misleads the body’s immune system into making antibodies that attack its own pancreatic cells. Type I diabetes generally brews for years, but appears abruptly. Then it rarely goes undiagnosed for more than a few weeks. The classic symptoms at diagnosis are increased urination, increased thirst, increased eating, and weight loss. Anyone with the classic symptoms should have a blood sugar test as well as a urine test. Occasionally people also report fatigue, blurred vision, vomiting, or abdominal pain. If the disease remains undiagnosed, symptoms often progress to include vomiting, labored breathing, and then coma. Chronic yeast infections (or other skin infections) can be an early warning sign. Healthy kids in diapers commonly get yeast diaper rashes. But if these infections are very frequent, or difficult to clear up with appropriate treatment, diabetes should be considered. If a child is out of diapers, I prefer checking a fasting blood sugar after only one yeast infection, especially if there is a family history of diabetes. No. The viral illness that triggers the disease is contagious, though. How long does diabetes last? This is a lifelong condition. We call it diabetes when the fasting blood sugar is higher than 126 mg/dL. Other tests are available for even earlier detection of the diabetes process. People with type 1 diabetes have measurable antibodies in their blood that reveal their autoimmune condition. One auto-antibody found in people with type 1 diabetes is the islet cell antibody. This antibody is often detectable months or years before symptoms appear. Other antibodies include the ICA 512 antibody and the GAD (or 64-K) antibody. The presence of these antibodies is a sign that the body is attacking its own insulin-producing cells. I expect that testing for auto-antibodies will get less expensive and more common over the next several years. Children with type I diabetes need insulin to replace what their pancreases have stopped making. The dose and delivery need to be carefully monitored to keep the blood sugars in the appropriate range. It is important to work closely with a professional skilled in treating this disease to stay on top of the latest developments, and to adjust management as needed, such as during infections or surgery. Exercise and a healthy diet are important for all children, but even more important for children with diabetes. Several medicines have been studied for delaying or preventing type I diabetes in high-risk children. Also, avoiding the early introduction of cow’s milk into the diets of children at high risk may delay or prevent diabetes. This may explain why diabetes is less common among breastfed children. The MMR vaccine may also prevent some diabetes, in that diabetes tends to be more common following outbreaks of mumps or rubella.